Webb Industries has introduced Telegärtner’s new, modular rail-mount fibre-optic distributor. The STX distributor can be extended according to actual needs, with stackable modules that allow for quick and easy additions and changes at any time. The STX range offers a broad portfolio of different modules that accept 12 fibres and ST, SC and LC adaptors, as well as a high-density LC module with 24 fibres. All modules are available for OM1 to OM4 multimode and OS2 single-mode fibres. 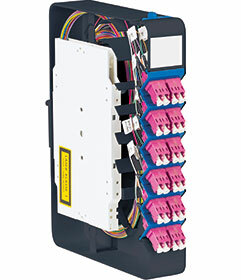 Customers can select from a variety of modules for pre-terminated breakout and mini-breakout cables. This includes modules with an integrated hinged splice cassette and pigtails stripped ready-to-splice, and modules for pre-terminated fibre-optic cables. The adaptors are mounted at a 45-degree angle so users can conveniently plug patch cords in and out using a minimum of valuable space. Horizontal cables can enter the modules from four different directions. This gives the installer the opportunity to decide on-site about the best cable routing. “This offers users and installers the maximum flexibility,” says Webb’s Stephen Hands. With dimensions of just 35 x 215 x 155 mm (two-module width), the compact modules make the most of available space, enabling users and installers alike to conveniently patch and store any fibre slack. The modules can be mounted on TH35 rails as specified in DIN 60715, and on flat surfaces/walls.